and excellent luster (what do you expect, it's a diamond) combine to make the gemstone coveted by all. Diamonds are the stuff of awesome. But do they really exist forever? Diamond is less stable than graphite, but the conversion rate from diamond to graphite is negligible at standard conditions. Huh. But Wikipedia doesn't mention how long. So how long would it take for this super-material to convert to the stuff I scribble with? Makes the entire lifespan of a red dwarf star seem like the Planck second. Enough time for you to sift through all the atoms in the entire UNIVERSE at a rate of one atom per second. Getting $67 worth of US quarters and flipping them, one per second, to get all heads-up. how long would it take for this super-material to convert to the stuff I scribble with? No, despite the fact that James Bond said "Diamonds are Forever", that is not exactly the case. Although Bond's statement is a fair approximation of reality it is not a scientifically accurate description of reality. As we'll soon see, even though diamond is slightly less stable than graphite, it is kinetically protected by a large activation energy. 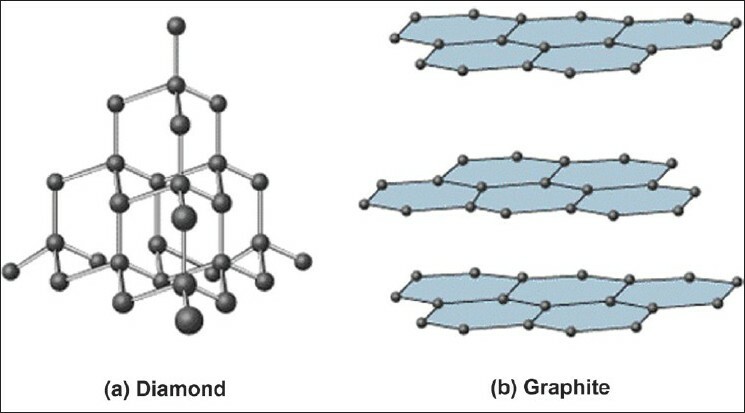 Here is a comparative representation of the structures of diamond and graphite. Note that diamond is composed of cyclohexane rings and each carbon is bonded to 2 more carbons external to the cyclohexane ring. On the other hand, graphite is comprised of benzene rings and each carbon is bonded to only 1 carbon external to the benzene ring. That means we need to break 6 bonds in diamond and not make any new bonds in order to convert diamond to graphite. A typical aliphatic C–C bond strength is ~340 kJ/mol. So to break 6 such bonds would require ~2000 kJ/mol. If the transition state were exactly midway between diamond and carbon, then we might approximate the activation energy as being half that value or ~1,000 kJ/mol. Since graphite is a bit more stable than diamond, we can refine our model and realize that the transition state will occur a bit before the mid-point. So our refined model would suggest an activation energy something less than 1,000 kJ/mol. An extremely large activation energy, so, as we anticipated the reaction would be very slow. An estimate of the activation energy puts it at 540 kJ/mol. So at least our rough approximation was in the right ballpark; however, it appears that the transition state is even further from the midpoint (closer to starting material) than we might have guessed. This activation energy tells us that at 25 °C, it would take well over a billion years to convert one cubic centimeter of diamond to graphite. I add an other answer : it depends what kind of people you are, if you are as crazy as them, of course not ! Well, it seems that diamond is not forever because upon exposure to sunlight it loses atoms. Not the answer you're looking for? Browse other questions tagged carbon-allotropes pressure or ask your own question. Why the transition of diamond to graphite is so slow? Is the valency of carbon satisfied in graphite? Are buckminsterfullerene-corannulene complexes actually stabilised by π stacking? How are pencil marks “adhered” to the paper? How are atoms encapsulated in buckminsterfullerene molecules? Why does it require so much pressure to create diamonds?